I have been a loyal customer of Scottrade for more than 5 years. Though I have opened a number of brokerage accounts during that time period, Scottrade remains my primary broker holding most of our investable assets. 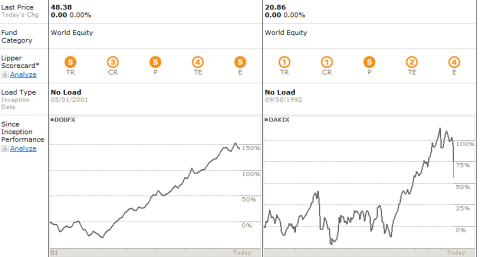 There are reasons for me to stick with Scottrade (Scottrade 3 free trades offer). 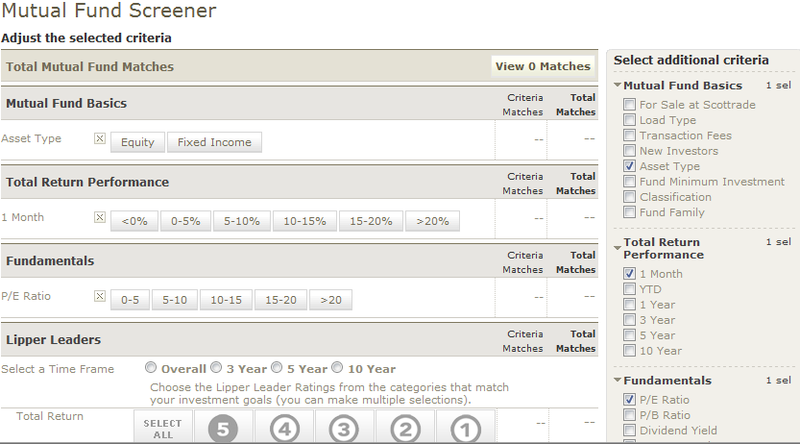 An easy-to-use mutual funds screener that can search funds by availability and other criteria. Detailed Lipper Leader ratings for all mutual funds. Detailed expense and performance information. 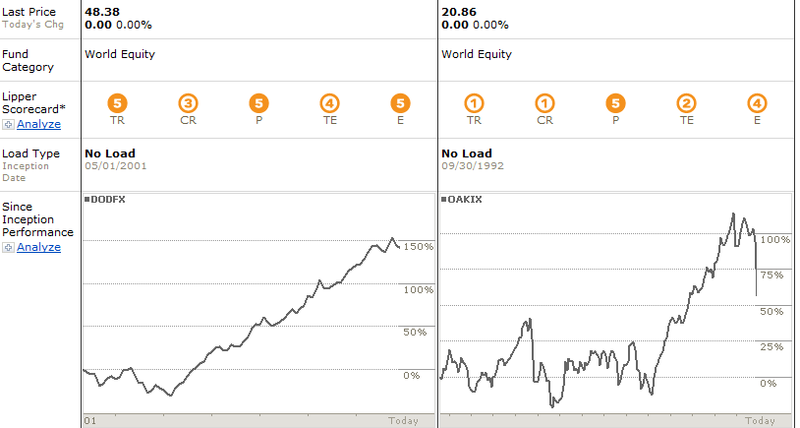 A new comparison tool that compares up to five mutual funds at a time. Though I no longer use Scottrade for mutual fund investment after they started to charge fees, I am still curious what changes have been made and whether the new features can make mutual fund research easier. After logging into my account last night and playing around with the new site, I feel that it’s quite impressive, though I also discovered some errors. 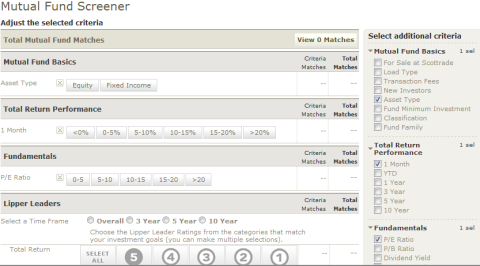 The new mutual fund center consists of four parts: Fund Screener, Comparison Tool, Commentary, and Top Performing Funds. 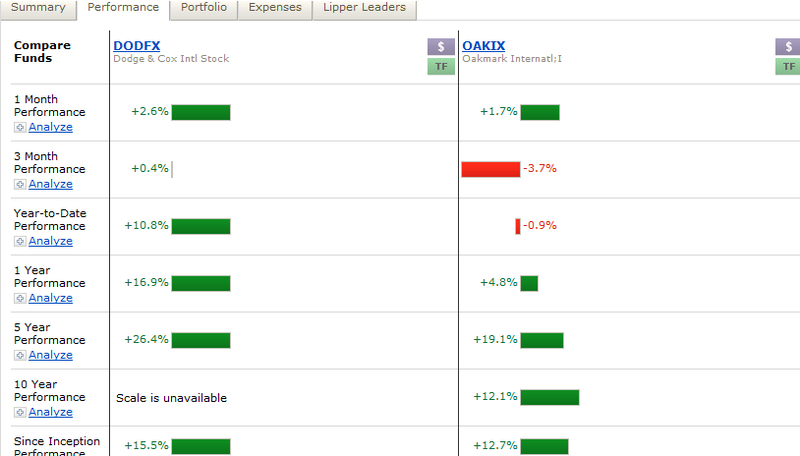 The first screen at the mutual fund center shows 5 funds that generated top returns in the past one-year period. Somehow, I feel this part of the information isn’t that helpful because not many people will make their investment decision based on 1 year performance. Interestingly, right now all the top 5 performing funds are related to China. Though 5-year and 10-year performance are provided, such information is not available for the top 5 funds as they are all very new, with a little more than one year of history. Unless such longer term performance data is also showing, I won’t pay much attention to the top 1-year top performers. 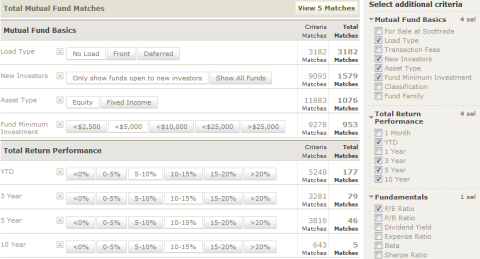 The next part I looked at is the fund comparison tool. According to Scottrade, up to 5 funds can be compared side by side. To get a feeling how the tool works, I compared two top international funds, DODFX and OAKIX, and found it’s quite good. The tool compares the fund’s performance (from 1 month to 10 years and since inception), portfolio (holdings and sector breakdown), expenses (expense ratio, load, fees, initial investment), and Lipper rankings (total return, consistent return, preservation, tax efficiency, and expense). The comparison summary page shows 1 year performance of the funds being compared (below, click to enlarge) with a graphic display of the funds’ returns in the past year. It also gives Lipper rankings on all the five categories as well as the fund’s performance since inception. I particularly like the performance chart of the fund since its inception since it gives me an idea of whether a fund has been consistent comparing against others. As for DODFX and OAKIX, it’s quite clear that DODFX has been delivering very consistent performance (below, click to enlarge) in the past five years or so, while OAKIX didn’t take off until about three years ago. The performance comparison page shows each fund’s returns from 1 month to 10 years as well as the performance since the fund’s inception. I have used a few fund screeners before and the one provided by Scottrade is quite different from others. Following is a screenshot of Scottrade’s mutual funds screener (click to enlarge). In stead of listing all the criteria in a big table, Scottrade breaks up the criteria into four groups and only show some very basic ones at the beginning. Users then have the option to add when they are interested in when screening funds. Note that the Transaction fee in the Mutual Fund Basics group refers to whether a transaction fee will charged if the fund is purchased at Scottrade, not the fund’s expense ratio (ER) which can be found in the Fundamentals group. I didn’t set limit on ER as well as transaction fees as I didn’t want see zero fund meet my conditions. There search returned five funds listed below, none of them I am familier with. While using the screener gave me a different experience, the resulted funds didn’t make me a lot of excitement. The reason is partly because the tool is provided by Scottrade, a broker, therefore it can only search those funds that investors can buy from Scottrade, limiting the search range. In addition, the screener doesn’t include such measurements as benchmark indices, fund assets, manager tenure, etc., making it less than the similar tool at Morningstar.com, which is one of my favorites. In general, I feel the new mutual fund center at Scottrade is a big improvement over its previous version, with more information and a user friendly interface. I especially like their graphic presentations of performances and allocations. 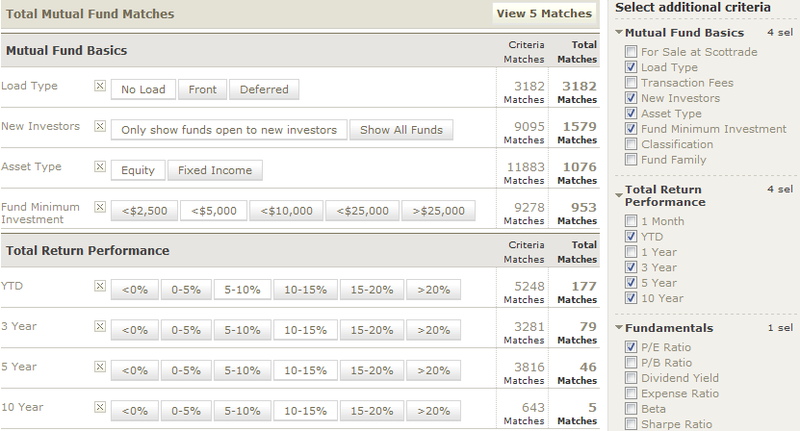 And the comparison tool is much useful than the fund screener, which can still use some enhancements. BTW, if you decided to open a Scottrade account, use promo code KGKP0724 to get 3 commission free trades.